set on a plastic soft drink lid to insulate against the ground. carefully placed over the burner. noise will signal that the flame has bloomed, and the stove is warmed up. 4. Now, the stove is ready to cook food! over the flame to extinguish it. My first post of the new year will deal with my little Trangia stove I’ve picked up a while ago. Now that I’ve been able to use it on a few day-hikes during the Christmas break, I can confidently review it. The first, and most obvious point, is that this is an alcohol stove; these stoves can burn the commonly found methanol, ethanol and even isopropyl rubbing alcohol. This stove cannot burn anything properly but alcohol – I tried white gasoline and ended up with a sooty, fireball-prone mess – and this could leave much to be desired in a third-world setting where kerosene/autogas (petrol) is all that may be found. But, here in Canada along with the US, most of South America, and Europe, methanol is easily found in nearly every hardware shop. Often it is labelled as ‘methyl hydrate’, and so people overlook it, but 4L can be be had for $10. wide enough to allow use of the simmer ring. “Great overall little burner – stows away well, is relatively lightweight and has a high heat output for an alcohol stove. What I love about the Trangias is their ability to store unused fuel inside them – this helps to reduce wastage, and on a day-hike, I don’t have to bring a separate fuel bottle. I just end up topping-off the burner and using the fuel left inside. I sprung for this burner because I was not willing to invest 60+ dollars on a full Trangia kit; instead I hacked apart a soup can and used that as a stand. Don’t hesitate to use this ‘replacement’ in stand-alone configuration; it still boils quickly and is quite wind proof *if* one uses a wind screen. Not the fastest boil times I’ll admit ( 7:10 for 2 cups @ room temp), but who’s counting minutes on the trail? It also doesn’t seem to have any problems in winter (unlike canister stoves), and my testing had 2 cups of water boil in 8:30 @ -10C. Comparable to or better than other alky stoves, IMO. True to my MEC review, the stove I use isn’t part of a Trangia Cookset. I have a real appreciation of the simpleness of the stove, which makes it near indestructible, albeit at the cost of a few BTUs of heat output. Pressurized stoves of all kinds cannot beat the venerable little Trangia when it comes to durability and the interval between maintenance periods (there IS no maintenance!). For the rough n’ tumble hiker who needs to boil a few cups water for a quick meal or even to frying an egg over-easy, it would be a good choice. For groups above 3 people, you will want to look elsewhere. Here, its benefits are complicated by the low heat output, limited fuel capacity, and large fuel consumption. It *will* take a good 30 minutes or so to bring 3 litres to boil in good conditions, and the low energy density of alcohol fuels means sometimes 2-3 times the volume of petroleum fuel needs to be burnt to cook equivalent meals. The benefits vs. an isobutane (canister) stove are obvious – far cheaper fuel costs, cheaper investment in the stove, and they work well even in winter conditions. Also, depending on the configuration of pot stand/wind screen, the alcohol stoves can outclass a canister stove in being lightweight. I really do like the Trangia stove units – which can be bought for $12 – and the complete cooksets, but I firmly believe that because of their niche status and lack of other competition (Sigg has not been manufacturing its version for a while), Trangia over-inflates the prices of their cooksets. Unless I found a 2-person cookset going for $30 or under, they are out of my league, and I feel them overpriced for the quality of the product. I own a Sigg Inoxal mini-cookset, purchased for $15 3 years ago. These pots are beautifully crafted, and well designed. They feature a black-painted aluminum exterior for strength and heat dispersion, but have an 18/8 stainless interior for cooking. This makes them lightweight, but sturdy, scrubbable with rocks + sand, and usable without fears of scratching the cook surface – or getting Alzheimers. Why then does it cost me $30 to buy a trangia mini cookset, which is just plain aluminum? The quality of the pressings isn’t up to Sigg’s snuff either. Trangia stove, DIY tin-can potstand, 75ml fuel bottle, and MSR windscreen at left. Unpacked: Potstand uncovered to show MSR windscreen and fuel bottle. a compact lighter, folding knife, salt+pepper shaker, and DIY SS spork+knife. For those minded like I am, purchase only the Trangia burner to use with another cookset. 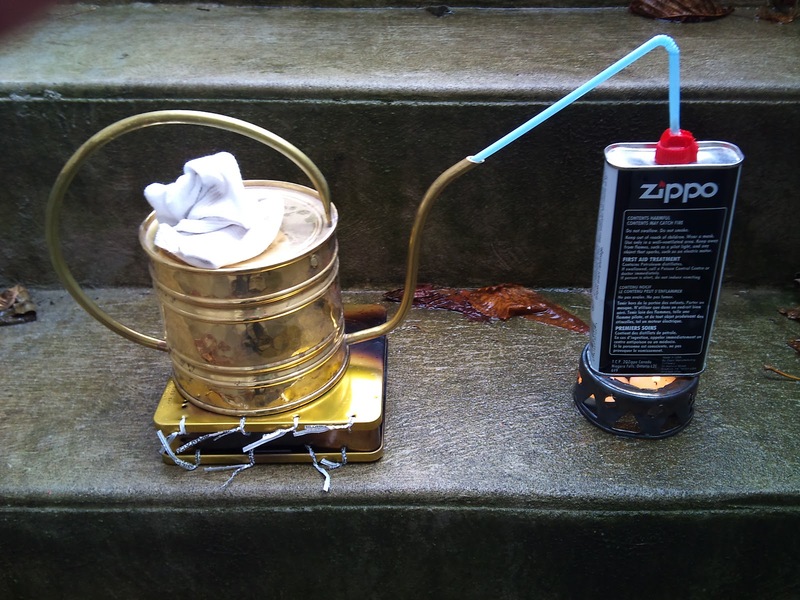 My homemade setup consists of the brass Trangia burner filled 3/4 with alcohol (160g), a steel soup can converted to a potstand (55g), a plastic softdrink lid to insulate the burner in winter (2g), and an MSR aluminum windscreen (45g). Very lightweight, and a good deal more windproof than a stock Trangia mini cookset would be. Stay tuned for more bike and gear reviews!